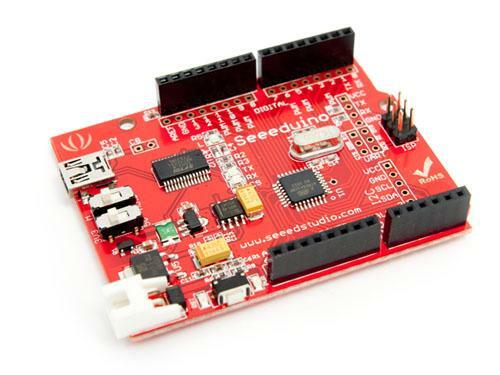 Seeeduino is Arduino compatible board. Its design is based on Diecimila scheme, 100% compatible to its existing program, shield and IDEs. On the hardware part, remarkable changes are taken to improve the flexibility and user experience. Inherits all of Arduino Diecimila's features. Compatible to Diecimila's pin layout, screw hole and dimensions. This documentation is licensed under the Creative Commons Attribution-Noncommercial-Share Alike License 3.0.Source code and libraries are licensed under GPL/LGPL, see source code files for details. Second power supply for 5V direct input. [Caution] USE 5V ONLY! Fixed bug - unnessesary via on Pin4 wire. Fixed bug - Lable mistakenly covered by switches. Added I2C and sensor port. Added an 100uF capacitor for vcc switch. Grouped new 100mil grid pins. Replaced reset buttons with metal ones. Rearranged texts and lables for clearer indications.